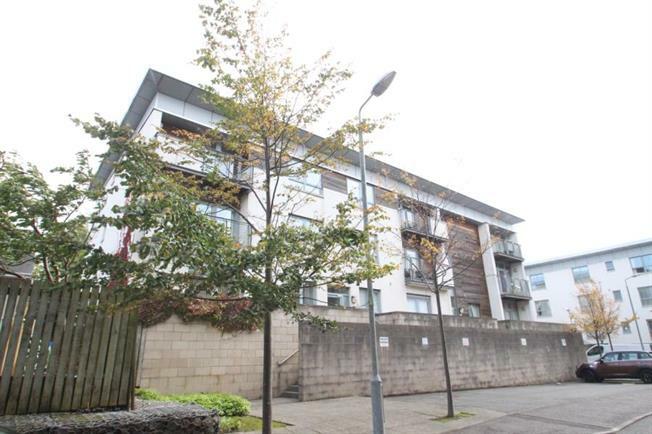 2 Bedroom Ground Floor Flat For Sale in Glasgow for Offers Over £165,000. A fabulous luxury, stand alone apartment building, set within a quiet, secluded location within maintained grounds. This prestigious modern development enjoys a prime location within the Langside area in the south side of Glasgow. Set within an elevated ground floor position, the accommodation is offered in walk-in condition with access to the communal hallway gained through a secure entry system. Reception hallway with storage, fabulous open plan living and dining room with french doors leading to great sized sun terrace. There is a high specification fully fitted kitchen with a quality range of appliances, including a oven and hob, integrated washing machine and dishwasher. There are two bedrooms, both of which have fitted wardrobes, the master is particularly well proportioned with en-suite off. Completing the accommodation is a quality three piece bathroom. The property also benefits from residents allocated parking to the front, double glazing and gas central heating.The communal areas are well managed and professionally factored. Prospecthill Grove is ideally located close to excellent local shopping and amenities. More extensive amenities are available at nearby Shawlands and Victoria Road. Public transport services, by both road and rail, provide swift commuter access to the City Centre and other surrounding areas. The Victoria Infirmary is also nearby as is Queens Park.